Members of the 2015 Master Gardener training class and proctors supporting the class recently had the opportunity to hear a presentation by Smithsonian horticulturist James Gagliardi on herbaceous plant selection and usage. Those who were not able to attend the lecture can still benefit from his knowledge in a book to which he was a major contributor. 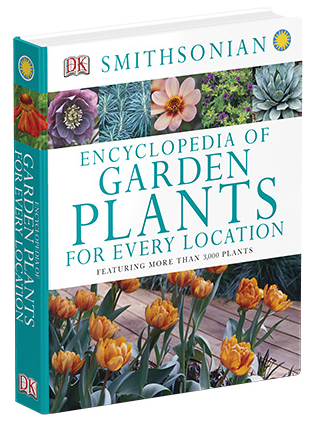 Smithsonian Encyclopedia of Garden Plants for Every Location, a 2014 Dorling Kindersley publication, features information on over 3,000 plants. The book begins with an introduction on plant groups (annuals and biennials, perennials, marginal and water plants, bulbs, shrubs, trees, and climbers), soil and site requirements, planting styles (natural, modern, and traditional), and planting methods. The diagrams picturing yards facing each of the cardinal directions throughout the day are particularly useful for understanding sun and shadow patterns of a given site. Readers will find a large version of the 2012 USDA Plant Hardiness Zone Map helpfully printed on both sets of end papers. The body of the encyclopedia is divided into two sections. The first, “Plant Locations,” provides plant recommendations for 30 types of sites. It is initially divided into Gardens in Sun and Gardens in Shade, and is further subdivided by soil types (clay, sandy) and special locations, such as ponds, walls and fences, herb gardens, rock gardens, and roof gardens, to name a few. Within each subsection, plants are listed alphabetically by botanical name. Each plant is pictured in a colorful thumbnail photograph, measuring at least 1 ¾ by 1 ½ inches. Brief descriptions include the most widely used common name, plant type, key characteristics, and size. Symbols are utilized to represent soil type, sun preference, toxicity, and hardiness. The symbol (N) designates North American Natives, plants indigenous to the United States, Canada, and/or Mexico. Also featured in this part of the book are two-page focus sections on plants of special interest, such as water lilies, clematis, irises, tomatoes, sedums, grasses, and ferns. Here readers will find more detailed information and additional photographs picturing various forms and species. The second half of the encyclopedia is titled “Plants for Special Effects.” The first subsection outlines possible plant choices for various garden styles: contemporary, formal, tropical, Asian, cottage. It also features suggestions for attracting wildlife and creating playful gardens to entertain children and stimulate their interest in nature. Other subsections focus on plants for seasonal interest, color and scent, and shape and texture. A final subsection on garden problems offers suggestions for dealing with sun-baked areas, water-logged sites, banks and slopes, weedy areas, and plant allergies, as well as slugs, rabbits, and deer. In the forward to the encyclopedia, the director of the Smithsonian Gardens, Barbara Faust, expresses the hope that this volume will become a favorite reference book for gardeners, providing inspiration and useful information for creating thriving and sustainable gardens. It is certainly a colorful, comprehensive, and attractively designed guide for gardeners of all levels who are gardening in a wide array of garden conditions. Hung Hing, China: Dorling Kindersley Limited, © 2014. This entry was posted in The Master Gardeners' Bookshelf and tagged Garden, gardening, MASTER GARDENERS’ BOOKSHELF, Smithsonian. Bookmark the permalink.